Game Day is on Sunday and it’s guaranteed that chips and dip will be involved. But then again, I don’t want a food hangover come Monday morning. 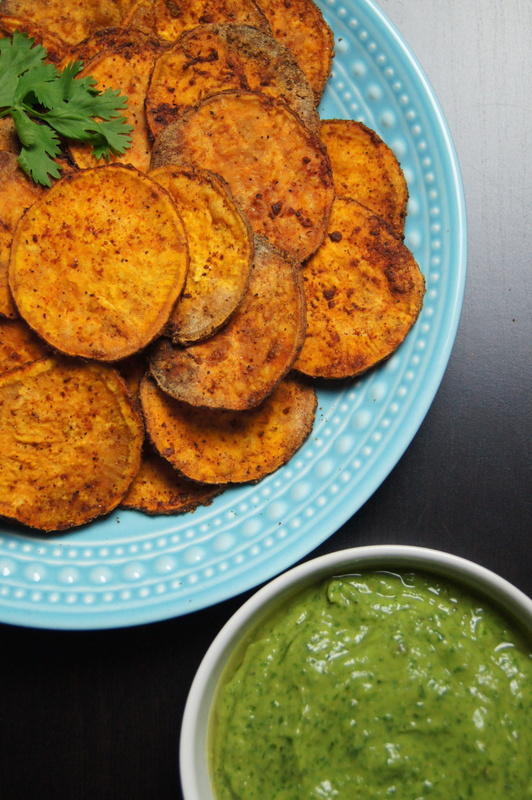 So to lighten things up a bit, yet not feel like I’ve lightened things up, I decided to give homemade sweet potato chips a try. 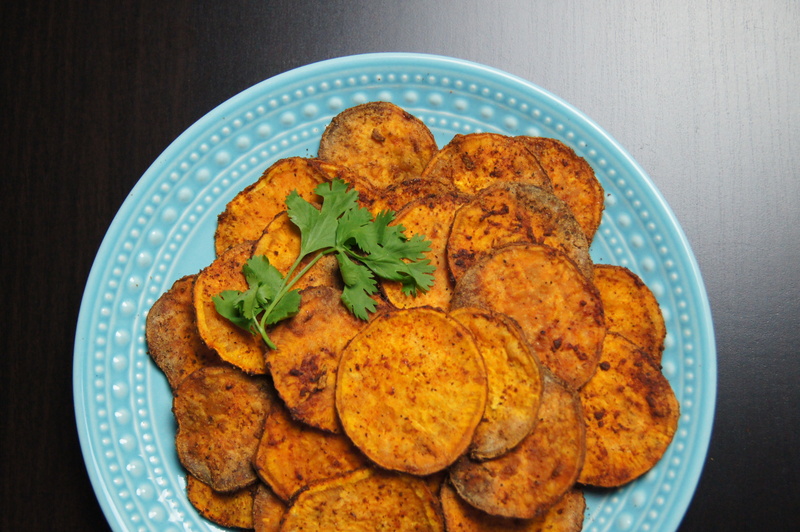 I usually buy a bag of sweet potato chips at the store and call it a day, but thought it was time I took the plunge and make them myself. The biggest obstacle was using my mandolin. I’ve had it for about four or five years now and have only used it once. And there’s a good reason for that. When I first bought it I was so happy and knew it would make my life so much easier. I was making a salad and wanted to include paper-thin sliced cucumbers and radishes in it. I set up the mandolin and started with the cucumbers. Easy, breezy. I could do this all day. I had maybe a few inches left of the cucumber and should have stopped. But, coming from the mindset of not wanting to waste anything, I kept on slicing away. The cucumber stub was too small and with one final slice part of my thumb went along with the rest of the cucumber slices. Seriously, I’m getting a little faint just remembering this. I won’t go into the gory details, but long story short, I was OK – I lost a bit of my thumb – but I was OK. Overall, I was an idiot for not using the food holder to protect my hand in the first place. Lessoned learned. Lesson learned hard. Rather than face my fear, I just decided not to use the mandolin anymore. Avoiding it and pretending it doesn’t exist seemed like a better option. Now that some time has passed I’ve decided that I’m just being lame and that today is a good day to face the mandolin head on and simply get over it and accept it back in my life again. So I took it out of hiding – used the protective food holder this time – and sliced away. No drama and no fear at all. I obviously made a big deal out of nothing.I was kicking myself for being stupid and thinking about all the other times in the past when I could have made my life so much better by using the mandolin instead of slicing something paper thin by hand and taking forever. 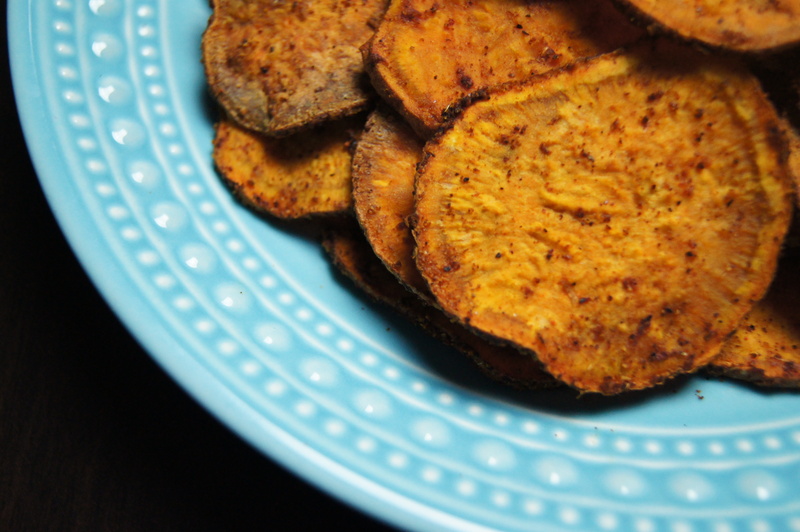 Thanks to my mandolin – and getting over my fear/lameness – I was able to make these yummy and healthy Baked Sweet Potato Chips. They had a lot of good flavor and tasted a little bit like barbeque potato chips. And anything barbeque potato chip flavored is always a good thing in my book. Also a good thing in my book: dip. 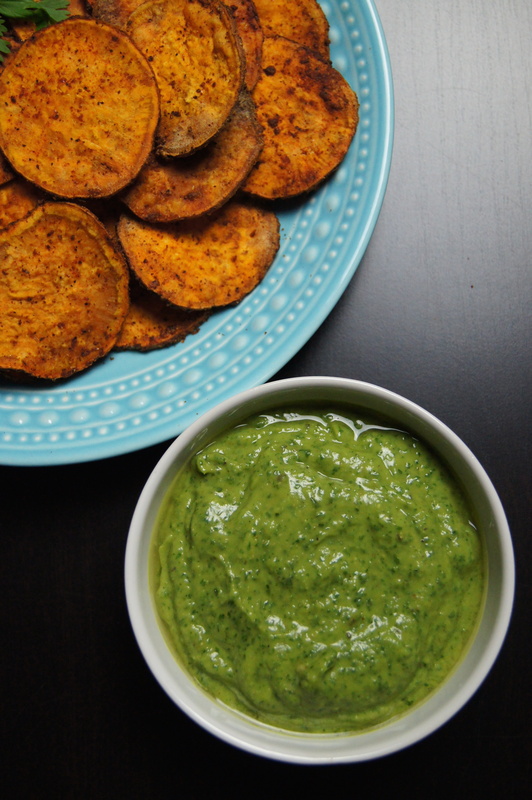 These sweet potato chips needed a good dip – like a good ranch-style dip. Considering I thought of this brilliant idea at the last minute and didn’t have the ingredients to make a ranch-style dip, that idea was tossed. I looked around at what I had – one avocado, a bit of cilantro, and a lime. Not enough to make guacamole, which really bummed me out. But it was enough to make something. 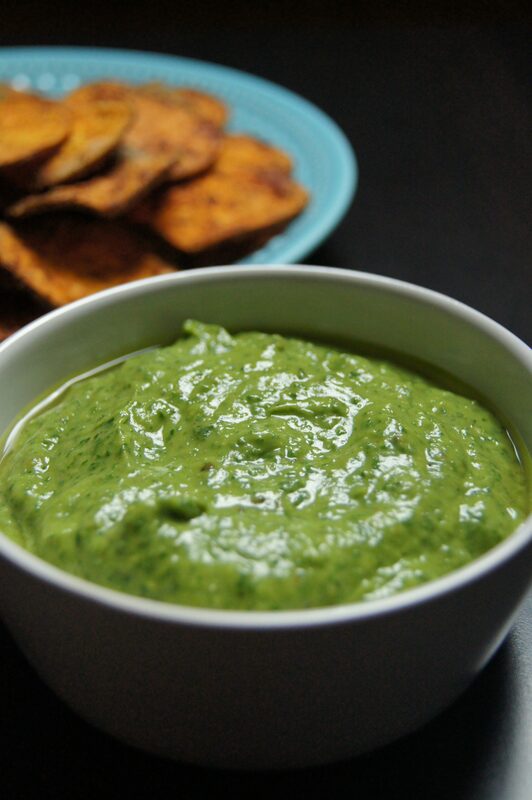 So I tossed all those ingredients in my food processor, along with a clove of garlic and some spices and came up with this Avocado Cilantro dip. I thought I was done, but felt like it needed something else to thin it out a little and give it a more vibrant color. I added a little bit of almond milk and the color and taste popped. If I had it, I would have used coconut milk, but the almond milk worked out really well. I’m glad that I made these chips and dips and they’ll be great for the Patriots game on Sunday. And, as always, it feels good to face my fears and realize that it wasn’t a big deal after all. The build-up in my head seems to always be the biggest obstacle. That being said, I’m still reserving my right to still refuse to go on a roller coaster. Preheat oven to 350 degrees F. Place two wire racks in two large rimmed baking sheets. Toss sweet potatoes in oil until evenly coated. In a separate large bowl, whisk together spices and cornstarch. Add sweet potatoes and toss until evenly coated in spice mixture. While the sweet potatoes bake, make dip. Scoop the avocado out of the skin and put in a food processor. Add remaining ingredients and puree. Taste for seasoning and add more salt, lime, and/or spices as needed.